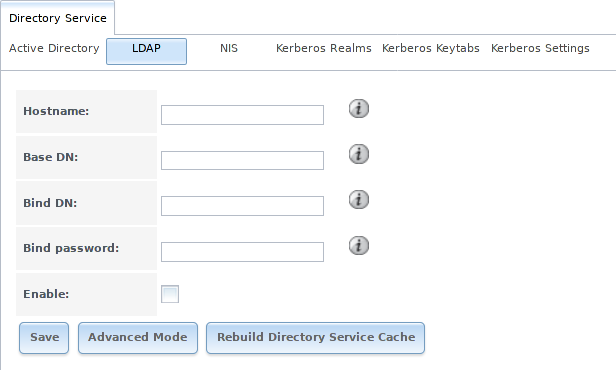 It also supports Kerberos Realms, Kerberos Keytabs, and the ability to add more parameters to Kerberos Settings. Many changes and improvements have been made to Active Directory support within FreeNAS®. It is strongly recommended to update the system to the latest FreeNAS® 11.2 before attempting Active Directory integration. Ensure name resolution is properly configured before configuring the Active Directory service. ping the domain name of the Active Directory domain controller from Shell on the FreeNAS® system. If the ping fails, check the DNS server and default gateway settings in Network ‣ Global Configuration on the FreeNAS® system. Add a DNS record for the FreeNAS® system on the Windows server and verify the hostname of the FreeNAS® system can be pinged from the domain controller. Using a FreeNAS® system as an AD server and connecting to it with a FreeNAS® client requires additional configuration. On the AD server, go to System ‣ CAs and create a new internal or intermediate Certificate Authority (CA). Highlight the created CA and click Export Certificate and Export Private Key to save these values. On the client web interface, select Directory Service ‣ Active Directory ‣ Advanced Mode. Set Encryption Mode to TLS and SASL wrapping to sign. Go to System ‣ CAs and click Import CA. Create a unique Identifier and paste the AD server CA certificate and private keys in those fields. Click OK and continue configuring AD. Figure 9.1.1 shows the screen that appears when Directory Service ‣ Active Directory is chosen. Table 9.1.1 describes the configurable options. Some settings are only available in Advanced Mode. To see these settings, either click Advanced Mode or configure the system to always display these settings by checking Show advanced fields by default in System ‣ Advanced. Domain Name (DNS/Realm-Name) string Name of Active Directory domain (example.com) or child domain (sales.example.com). This setting is mandatory and the GUI will refuse to save the settings if the domain controller for the specified domain cannot be found. Domain Account Name string Name of the Active Directory administrator account. This setting is mandatory and the GUI will refuse to save the settings if it cannot connect to the domain controller using this account name. Domain Account Password string Password for the Active Directory administrator account. This setting is mandatory and the GUI will refuse to save the settings if it cannot connect to the domain controller using this password. AD check connectivity frequency (seconds) integer How often to verify that Active Directory services are active. How many recovery attempts integer Number of times to attempt reconnecting to the Active Directory server. Tries forever when set to 0. Enable Monitoring checkbox Restart Active Directory automatically if the service is disconnected. Setting this prevents configuring the Domain Controller service. Encryption Mode drop-down ✓ Choices are Off, SSL (LDAPS protocol port 636), or TLS (LDAP protocol port 389). See http://info.ssl.com/article.aspx?id=10241 and https://hpbn.co/transport-layer-security-tls/ for more information about SSL and TLS. Select the Active Directory server certificate if SSL connections are used. If a certificate does not exist, create a Certificate Authority, then create a certificate on the Active Directory server. Import the certificate to the FreeNAS® system using the Certificates menu. To clear a saved certificate, choose the blank entry and click Save. Verbose logging checkbox ✓ Set to log attempts to join the domain to /var/log/messages. UNIX extensions checkbox ✓ Only set if the AD server is explicitly configured to map permissions for UNIX users. Enabling provides persistent UIDs and GUIDs, otherwise, users/groups are mapped to the UID/GUID range configured in Samba. Allow Trusted Domains checkbox ✓ Only enable if the network has active domain/forest trusts and files need to be managed on multiple domains. Use with caution as it will generate more winbindd traffic, slowing down the ability to filter through user and group information. Use Default Domain checkbox ✓ Unset to prepend the domain name to the username. If Allow Trusted Domains is set and multiple domains use the same usernames, unset to prevent name collisions. Allow DNS updates checkbox ✓ Unset to disable Samba from doing DNS updates when joining a domain. Disable Active Directory user/group cache checkbox ✓ Set to disable caching of AD users and groups. This is useful if the system cannot bind to a domain with a large number of users or groups. Site Name string ✓ The relative distinguished name of the site object in Active Directory. Domain Controller string ✓ The server that manages user authentication and security as part of a Windows domain. Leave empty for FreeNAS® to use the DNS SRV records to automatically detect and connect to the domain controller. If the domain controller must be set manually, enter the server hostname or IP address. Global Catalog Server string ✓ The global catalog server holds a full set of attributes for the domain in which it resides and a subset of attributes for all objects in the Microsoft Active Directory Forest. See the IBM Knowledge Center. Leave empty for FreeNAS® to use the DNS SRV records to automatically detect and connect to the server. If the global catalog server must be entered manually, enter the server hostname or IP address. Kerberos Realm drop-down menu ✓ Select the realm created using the instructions in Kerberos Realms. Kerberos Principal drop-down menu ✓ Browse to the location of the keytab created using the instructions in Kerberos Keytabs. AD timeout integer ✓ In seconds, increase if the AD service does not start after connecting to the domain. DNS timeout integer ✓ In seconds, increase if AD DNS queries timeout. Idmap backend drop-down menu and Edit ✓ Select the backend to use to map Windows security identifiers (SIDs) to UNIX UIDs and GIDs. See Table 9.1.2 for a summary of the available backends. Click the Edit link to configure the backend. Windbind NSS Info drop-down menu ✓ Defines the schema to use when querying AD for user/group info. rfc2307 uses the RFC2307 schema included in Windows 2003 R2, sfu20 is for Services For Unix 3.0 or 3.5, and sfu is for Services For Unix 2.0. SASL wrapping drop-down menu ✓ Defines how LDAP traffic is transmitted. Choices are plain (plain text), sign (signed only), or seal (signed and encrypted). Windows 2000 SP3 and newer can be configured to enforce signed LDAP connections. Enable checkbox Enable the Active Directory service. NetBIOS name string ✓ Limited to 15 characters. Automatically populated with the original hostname of the system. This must be different from the Workgroup name. NetBIOS alias string ✓ Limited to 15 characters. ad AD server uses RFC2307 or Services For Unix schema extensions. Mappings must be provided in advance by adding the uidNumber attributes for users and gidNumber attributes for groups in the AD. autorid Similar to rid, but automatically configures the range to be used for each domain, so there is no need to specify a specific range for each domain in the forest. The only needed configuration is the range of UID/GIDs to use for user/group mappings and an optional size for the ranges. fruit Generate IDs the way Apple Mac OS X does, so UID and GID can be identical on all FreeNAS® servers on the network. For use in LDAP environments where Apple’s Open Directory is the authoritative LDAP server. ldap Stores and retrieves mapping tables in an LDAP directory service. Default for LDAP directory service. nss Provides a simple means of ensuring that the SID for a Unix user is reported as the one assigned to the corresponding domain user. rfc2307 An AD server is required to provide the mapping between the name and SID and an LDAP server is required to provide the mapping between the name and the UID/GID. rid Default for AD. Requires an explicit idmap configuration for each domain, using disjoint ranges where a writeable default idmap range is to be defined, using a backend like tdb or ldap. script Stores mapping tables for clustered environments in the winbind_cache tdb. tdb Default backend used by winbindd for storing mapping tables. tdb2 Substitute for tdb used by winbindd in clustered environments. Click Rebuild Directory Service Cache if a new Active Directory user needs immediate access to FreeNAS®. This occurs automatically once a day as a cron job. If there are problems connecting to the realm, verify the settings do not include any disallowed characters. Active Directory does not allow $ characters in Domain or NetBIOS names. The length of those names is also limited to 15 characters. The Administrator account password cannot contain the $ character. If a $ exists in the domain administrator password, kinit reports a “Password Incorrect” error and ldap_bind reports an “Invalid credentials (49)” error. To manually check that a specified user can authenticate, use net ads join -S dcname -U username. getent passwd and getent group can provide more troubleshooting information if no users or groups are listed in the output. Sometimes network users do not appear in the drop-down menu of a Permissions screen but the wbinfo commands display these users. This is typically due to the FreeNAS® system taking longer than the default ten seconds to join Active Directory. Increase the value of AD timeout to 60 seconds. To change a certificate, set the Encryption Mode to Off, then disable AD by unchecking Enable. Click Save. Select the new Certificate, set the Encryption Mode as desired, check Enable to re-enable AD, and click Save to restart AD. When running AD in a 2003/2008 mixed domain, see this posting for instructions to prevent the secure channel key from becoming corrupt. Active Directory uses DNS to determine the location of the domain controllers and global catalog servers in the network. Use host -t srv _ldap._tcp.domainname.com to determine the SRV records of the network and change the weight and/or priority of the SRV record to reflect the fastest server. More information about SRV records can be found in the Technet article How DNS Support for Active Directory Works. The realm used depends upon the priority in the SRV DNS record. DNS can override the system Active Directory settings. When unable to connect to the correct realm, check the SRV records on the DNS server. If the cache becomes out of sync due to an AD server being taken off and back online, resync the cache using Directory Service ‣ Active Directory ‣ Rebuild Directory Service Cache. An expired password for the administrator account will cause kinit to fail. Ensure the password is still valid. Also, double-check the password on the AD account being used does not include any spaces, special symbols, and is not unusually long. If the Windows server version is lower than 2008 R2, try creating a Computer entry on the Windows server’s OU. When creating this entry, enter the FreeNAS® hostname in the name field. Make sure it is under 15 characters, the same name as the one set in the Hostname field in Network ‣ Global Configuration, and the same NetBIOS Name in Directory Service ‣ Active Directory settings. Make sure the hostname of the domain controller is set in the Domain Controller field of Directory Service ‣ Active Directory. If any of the commands fail or result in a traceback, create a bug report at https://redmine.ixsystems.com/projects/freenas/issues that includes the commands in the order in which they were run and the exact wording of the error message or traceback. FreeNAS® includes an OpenLDAP client for accessing information from an LDAP server. An LDAP server provides directory services for finding network resources such as users and their associated permissions. Examples of LDAP servers include Microsoft Server (2000 and newer), Mac OS X Server, Novell eDirectory, and OpenLDAP running on a BSD or Linux system. If an LDAP server is running on the network, configure the FreeNAS® LDAP service so network users can authenticate to the LDAP server and have authorized access to the data stored on the FreeNAS® system. LDAP authentication for SMB shares is disabled unless the LDAP directory has been configured for and populated with Samba attributes. The most popular script for performing this task is smbldap-tools. In addition, the LDAP server must support SSL/TLS and the certificate for the LDAP server CA must be imported with System ‣ CAs ‣ Import CA. Note that non-CA certificates are not supported at this time. Figure 9.2.1 shows the LDAP Configuration screen that is seen after clicking Directory Service ‣ LDAP. Table 9.2.1 summarizes the available configuration options. Some settings are only available in Advanced Mode. To see these settings, either click the Advanced Mode button or configure the system to always display these settings by checking the box Show advanced fields by default in System ‣ Advanced. Those new to LDAP terminology should read the OpenLDAP Software 2.4 Administrator’s Guide. Hostname string Hostname or IP address of the LDAP server. Base DN string Top level of the LDAP directory tree to be used when searching for resources. Example: dc=test,dc=org. Bind DN string Name of administrative account on the LDAP server. Example: cn=Manager,dc=test,dc=org. Bind password string Password for Root bind DN. Allow Anonymous Binding checkbox ✓ Instructs the LDAP server to not provide authentication and to allow read and write access to any client. User Suffix string ✓ Optional. Can be added to the name when the user account is added to the LDAP directory. Example: dept. or company name. Group Suffix string ✓ Optional. Can be added to the name when the group is added to the LDAP directory. Example: dept. or company name. Password Suffix string ✓ Optional. Can be added to the password when the password is added to LDAP directory. Machine Suffix string ✓ Optional. Can be added to the name when the system added to the LDAP directory. Example: server, accounting. SUDO Suffix string ✓ Use if LDAP-based users need superuser access. Kerberos Principal drop-down menu ✓ Browse to the location of the principal in the keytab created as described in Kerberos Keytabs. Encryption Mode drop-down menu ✓ Choices are Off, SSL, or TLS. Note that either SSL or TLS and a Certificate must be selected for authentication to work. SSL selects LDAPS protocol (port 636). TLS selects LDAP protocol (port 389). Certificate drop-down menu ✓ Select the certificate of the LDAP CA (required if authentication is used). The certificate for the LDAP server CA must first be imported with System ‣ Certificates ‣ Import Certificate. LDAP timeout integer ✓ Increase this value (in seconds) if obtaining a Kerberos ticket times out. DNS timeout integer ✓ Increase this value (in seconds) if DNS queries timeout. Idmap backend drop-down menu and Edit ✓ Select the backend to use to map Windows security identifiers (SIDs) to UNIX UIDs and GIDs. See Table 9.1.2 for a summary of the available backends. Click the Edit link to configure the selected backend. Samba Schema checkbox ✓ Set if LDAP authentication for SMB shares is needed and the LDAP server is already configured with Samba attributes. Auxiliary Parameters string ✓ Additional options for sssd.conf(5). Schema drop-down menu ✓ If Samba Schema is set, select the schema to use. Choices are rfc2307 and rfc2307bis. Enable checkbox Unset to disable the configuration without deleting it. FreeNAS® automatically appends the root DN. This means the scope and root DN are not to be included when configuring the user, group, password, and machine suffixes. LDAP users and groups appear in the drop-down menus of the guilabel: Permissions screen of a dataset after configuring the LDAP service. Type getent passwd from Shell to verify the users have been imported. Type getent group to verify the groups have been imported. To clear LDAP users and groups from FreeNAS®, go to Directory Services ‣ LDAP, clear the Hostname field, unset Enable, and click Save. Confirm LDAP users and groups are cleared by going to the Shell and viewing the output of the getent passwd and getent group commands. The Network Information Service (NIS) maintains and distributes a central directory of Unix user and group information, hostnames, email aliases, and other text-based tables of information. If an NIS server is running on the network, the FreeNAS® system can be configured to import the users and groups from the NIS directory. Figure 9.3.1 shows the configuration screen which opens after navigating Directory Service ‣ NIS. Table 9.3.1 summarizes the configuration options. NIS domain string Name of NIS domain. NIS servers string Comma-delimited list of hostnames or IP addresses. Secure mode checkbox If set, ypbind(8) will refuse to bind to any NIS server that is not running as root on a TCP port number over 1024. A default Kerberos realm is created for the local system in FreeNAS®. 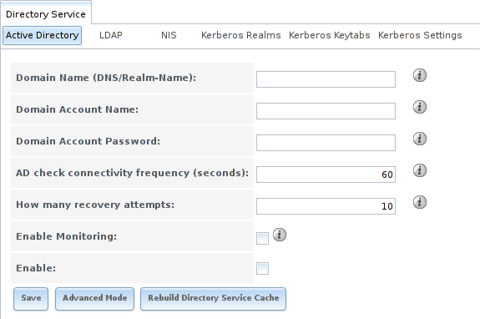 Directory Service ‣ Kerberos Realms can be used to view and add Kerberos realms. If the network contains a KDC, click Add kerberos realm to add the realm. This configuration screen is shown in Figure 9.4.1. Table 9.4.1 summarizes the configurable options. Some settings are only available in Advanced Mode. To see these settings, either click Advanced Mode or configure the system to always display these settings by checking the box Show advanced fields by default in System ‣ Advanced. Realm string Mandatory. Name of the realm. KDC string ✓ Name of the Key Distribution Center. Admin Server string ✓ Server where all changes to the database are performed. Password Server string ✓ Server where all password changes are performed. Kerberos keytabs are used to do Active Directory or LDAP joins without a password. This means the password for the Active Directory or LDAP administrator account does not need to be saved into the FreeNAS® configuration database, which is a security risk in some environments. freenas.keytab is the file to upload to the FreeNAS® server. useraccount is the name of the user account for the FreeNAS® server generated in Active Directory Users and Computers. http/useraccount@EXAMPLE.COM is the principal name written in the format host/user.account@KERBEROS.REALM. By convention, the kerberos realm is written in all caps, but make sure the case used for the Kerberos Realm matches the realm name. See this note about using /princ for more details. userpass is the password associated with useraccount. DES-CBC-CRC is used for compatibility. DES-CBC-MD5 adheres more closely to the MIT implementation and is used for compatibility. 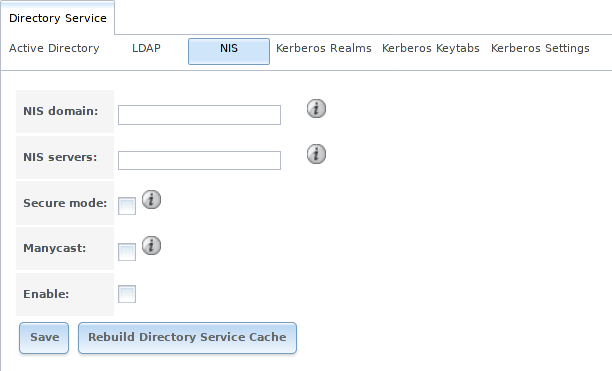 After the keytab is generated, use Directory Service ‣ Kerberos Keytabs ‣ Add kerberos keytab to add it to the FreeNAS® system. To instruct the Active Directory service to use the keytab, select the installed keytab using the drop-down Kerberos keytab menu in Directory Service ‣ Active Directory. When using a keytab with Active Directory, make sure that the “username” and “userpass” in the keytab matches the “Domain Account Name” and “Domain Account Password” fields in Directory Service ‣ Active Directory. To instruct LDAP to use a principal from the keytab, select the principal from the drop-down Kerberos Principal menu in Directory Service ‣ LDAP.